When Tim Kearney draws a license plate across the throat of a Hell's Angel, he's pretty much a dead man. It's his third crime and, according to California law, that gives him "life without the possibility of parole." Killing a Hell's Angel also makes him a dead man on any prison yard in California. That's when the DEA makes Kearney an offer: impersonate the late, legendary dope smuggler Bobby Z so that the agency can trade him to Don Huertero -- northern Mexico's drug kingpin -- for a captured DEA agent. Tim Kearney bears an uncanny resemblance to Bobby Z, and, with some training, he might be able to pass. Or not. But, really, what choice does he have? So, he's off to a compound in the middle of a desert that's been designed by Huertero's number-two man to look like the Arab fort in his favorite movie, Beau Jeste ("The Santa Fe thing had been done to death.") Kearney's surprised when he meets Bobby Z's old flame, Elizabeth, who was never mentioned in his training, and her son, who she claims belongs to him. It's a short vacation by the pool before Kearney's on the run from drug lords, bikers, Indians, and cops ... and the kid's along for the ride. 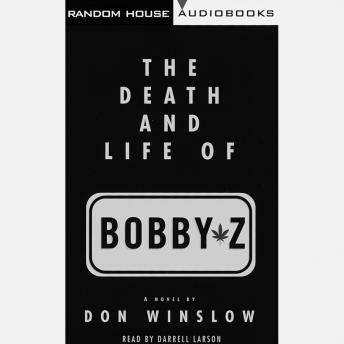 Some of the pursuers want Bobby Z, and some want the considerably less legendary Tim K. Whether he pulls it off, whether he can keep the kid and the girl and his life, makes for a hilarious, fast-paced, and truly touching audio.